A John Shill arrived in Halifax on the Allan Line's S.S. Siberian in February of 1907. John Shill’s daughter, Nell, claimed that he came to Montreal two years before the family did. If so, he would have arrived in 1906. No record has been found to support that assertion. Possibly his name is on a different passenger list but not clearly recorded. Nevertheless, the most likely candidate is the John Shill who arrived in Canada on the Siberian in Steerage in February 1907. His age as it is recorded on the manifest is 10 years off. Could he have lied about it to make himself a more desirable immigrant?? First launched in 1884 and making its last Halifax to Glasgow crossing in 1910, the Siberian was nearing the end of its service in 1907. Although the information on theshipslist.com gives passenger capacity of more than 1100 passengers, the specific crossing considered here carried a total of only 154 passengers: 112 bound for Canadian destinations (7 second cabin; 105 steerage) and 42 for the US (6 second cabin; 36 steerage). Why were there so few passengers on this trip? The Siberian boarded passengers in Glasgow and Liverpool, departing Liverpool on Saturday the 26th of January, 1907. Bound for both Halifax and Philadelphia, the ship arrived in Halifax on Sunday, February 10th, 1907 landing at 9:25 am. Passengers would have traveled onward by rail. The following table shows passengers’ countries of birth. Of the seven passengers traveling to Canada in second cabin, six were born in England and 1 in Canada. By contrast, the greatest percentage of steerage passengers bound for Canada originated in Russia (42%) another 18% were born in Armenia and just fewer than 20% were born in England. 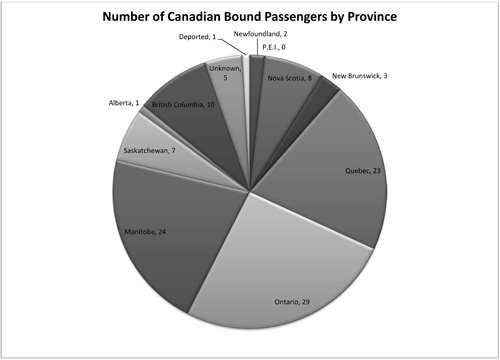 The following chart shows numbers of passengers bound for the various Canadian provinces. All Quebec-bound passengers were headed for Montreal. Apart from John Shill, not one of the other passengers on the above list reside in Montreal on the 1911 census, nor can they be found with any certainty to be living anywhere in Canada!